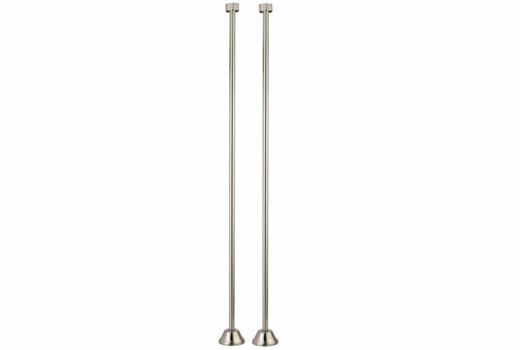 The CC415T8 is a Satin Nickel clawfoot or freestanding tub faucet. 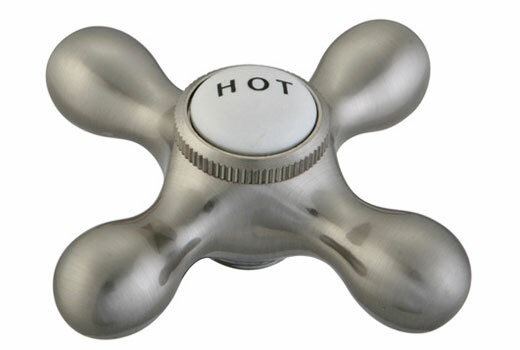 This gorgeous faucet has an adjustable spread and comes with the metal cross handles and hand shower. 10 YEAR LIMITED WARRANTY Kingston Brass warrants its faucets to be flawless during normal residential use. If the faucet should leak or drip during normal use, you may obtain warranty parts with the original place of purchase. 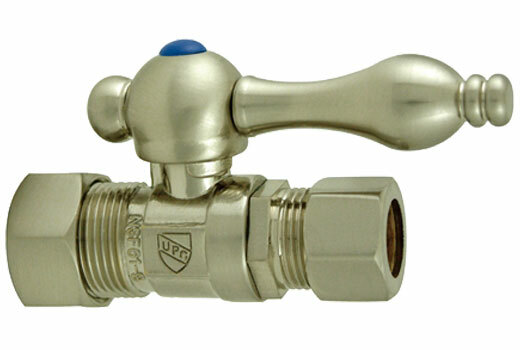 If these parts are unavailable by the original place of purchase then Kingston Brass Inc. will, free of charge, mail the original owner the cartridge or parts necessary to put the faucet in good working condition. All warranty parts will be shipped freight prepaid ground service. If expedited shipping is requested customer will be responsible for freight charges. 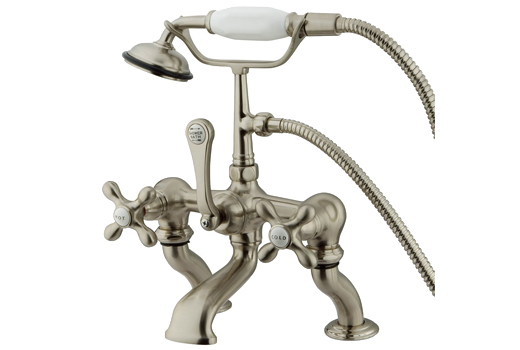 This product warranty applies only to Kingston Brass Faucets installed in the United States ONLY. Kingston Brass also warrants all other aspects of the faucet or accessories, to be free of defects in material and workmanship during normal residential use within (10) ten years from the date of purchase to it's original owner, EXCEPT Oil Rubbed Bronze and Dark Bronze since they are considered Living Finishes and as such, color changes are part of the normal Living Finish Behavior, However Oil Rubbed Bronze and Dark bronze Faucets still carry Kingston Brass' 10 year mechanical warranty. Kingston Brass will, at its election, repair, provide replacement part(s), or make appropriate adjustment. Damage to any product caused by accident, misuse, or abuse will void the faucets (10) year limited warranty. Improper cleaning and care will also void the faucets warranty. Proof of purchase (original sales receipt) MUST be provided to Kingston Brass Inc with all warranty claims. Kingston Brass will not be held responsible for labor charges, installation, or other incidental or consequential cost. In no event shall the liability of Kingston Brass Inc exceed the purchase price of the item purchased. To obtain warranty service please contact your Original place of purchase, Plumbing Contractor or you may contact Kingston Brass *NEVER USE CLEANERS CONTAINING ABRASIVE CLEANERS, AMMONIA, BLEACH, ACIDS, WAXES, ALCOHOL, SOLVENTS OR OTHER PRODUCTS NOT RECOMMENDED FOR CHROME FINISHES. THIS WILL VOID THE ITEMS 10 YEAR LIMITED WARRANTY.